Ants act as one giant super-organism. Individual ant is not important. Serving the community is the primary purpose. Like pre-programmed robots, each ant is doing its role until it dies. The role of an ant is determined by its physical characteristics. Here are the different roles of ants. There are cutter ants who measure a piece of plant, and then use their scissor-like jaws to cut that piece off. When they do that, they are usually trying not to stand on the piece that is going to be falling to the ground. But sometimes, even super ants make mistakes. Once a piece falls to the ground, there is another type of cutter ants waiting on the ground, to cut the piece into smaller pieces for transportation. Cutting is a very intensive task, requiring four times more calories than what ants need for running. Once the pieces are cut, there are runner ants, who carry the pieces to the base. And carrying in this case is like running a marathon with a load of up to 100 times heavier than your body weight. Lab experiments have shown that an ant can hold a load 100 times its body weight, while holding onto glass with its feet, upside down. Back at the base, there are smaller ants, who wouldn't be able to cut or carry loads, but who take care of supplies at the base. Now all that happens once a good food location is found. But first, scout ants are dispersed into different directions looking for a good food supply. As they run, they leave chemical marks at specific intervals with their bodies. The more ants leave marks on a specific trail, the more attractive it seems to others. Once an ant finds a food supply, it takes in as much food as possible into a social stomach, not for itself, but to share with others later. Once it gets as much as it can hold, it runs back, leaving a continuous chemical trail with its body now. As it meets other ants on the way back, it lets them taste the food it found, from its social stomach. Locations with good food supplies are later visited by groups of cutter and runner ants. An individual ant would be very easy to defeat. But when they are together, they are unbeatable by even bears. When a bear attracted by the smell of nectar stored inside an ant city tries to get inside, he is greeted by a strong defense force. Ants inside the city start spraying irritating liquid into his eyes and nostrils, until the bear changes his mind and moves on to other places. A bee is much larger than ants, but when it is attacked by a group of ants, it is virtually defenseless, due to their highly coordinated attack strategy. 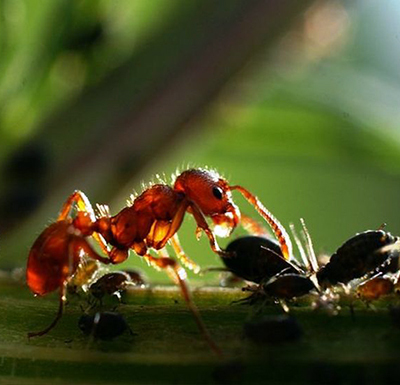 Besides attacking much larger creatures, ants build traps to catch much bigger creatures. These traps are constructed from plant material, and look like vases. These vessels are filled with water. Only small ants constructing these have enough stickiness to their feet to not slip on this material. Larger bugs are attracted to the vessel, slip on its edge, and drown. Ants' architectural and engineering skills are surpassed only by humans. An intricate system of tunnels and chambers are constructed underground, and can go as deep as 8 feet down, and have an area of 50 square feet. But not all ant cities are large. Some may be built inside of an acorn, and run only by a few ants. Who starts construction of ant cities? The queen ant. Not all ants lay eggs, only queen ants do. Queen ants are much larger than regular worker ants. From a bunch of eggs laid, some turn out to be queen ants with wings. Queen ants store large amounts of fat inside their large stomachs, which will feed them while they lay eggs in the future. Then there are male ants, whose only purpose is to fertilize the queen ants. Several male ants may lay eggs inside of one queen ant. Once they are done passing eggs, they die. Their offspring may not come into the world for as long as 20 years. When a queen ant has enough eggs, she spreads her wings and flies away, to search for a location to establish a new colony. Once a location is found, she gets to laying eggs and bringing up young ants. She uses the fat inside her stomach to live on, until her first children go outside and start bringing food. There is one threat that ants cannot defend themselves against. That threat is fire. And they don't try to defend themselves against it. If fire reaches their workplace, they don't run away, they continue performing their pre-programmed tasks until they melt in the heat. Fire also erases the chemical trails drawn by scout ants. Without their chemical trails, a highly organized workplace becomes a place of chaos. Ants run in different directions and nothing can get done. But not for long. Scout ants resume their work. They lay down new trails, and order is restored. The work is resumed. Ants - Nature's Secret Power. Prod. Wolfgang Thaler. Screenplay by Bert Hoelldobler. Universum Documentaries, 2004. DVD.